MaxAim DI 4.20 Released – New features and improvements! We are happy to announce a new release of MaxAim DI (4.20). Special thanks to Contract Killer, Deenox Don and Paul Acevedo for the feedback and the suggestions that are now incorporated on MaxAim DI. Option to use just the ESC key to leave Capture Mode. Independent XInput implementation (not relying on DirectInput). Data normalization made by MaxAim (not relying on DirectInput). Bind the DI entries to the button layout by just pressing the desired button on the controller. Play PS4, XBox One, PS3 and XBox 360 games with a keyboard, mouse, steering wheel, driving wheel, flightstick, fight stick, joystick and so on. The MaxAim DI enables console owners to use the PC keyboard and mouse to play games with the accuracy and dexterity similar as enjoyed by PC gamers. With the DirectInput/XInput feature you can now use any game controller of your PC through the DirectInput interface. This includes steering wheels, driving wheels, flightsticks, fight sticks, joysticks, etc. Just bind the DirectInput entries to the MaxAim DI controller layout and you are ready to go! Gtuner Pro version 3.10 released! Fulfilling our commitment of always keep bringing new features for Titan One device and its software components, we are happy to announce the release of a new version of Gtuner Pro (3.10). 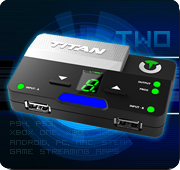 We wish to thank our ConsoleTuner community for all the suggestions and feedback we received, that are now incorporated in Gtuner Pro and the Titan One device. Along with the new Gtuner Pro we also released a new version of Titan One firmware (2.05) and a new version of the MaxAim DI plugin (4.02). Below is listed the major features implemented on Gtuner Pro 3.10. For the complete changelog, please visit the download page on ConsoleTuner.com. 1) XBox One controller left and right trigger rumble status: Displays the current speed of the left and right rumble engines of the XBox One controller triggers. 2) Slot Name: Shows the name assigned to the currently selected memory slot. Very handy feature to check what Script or GamePack is stored into a specific memory slot. 3) New Gtuner’s option to automatically open the GamePack configuration window after drag-and-drop a GamePack into a memory slot. 4) Dualshock 4 – Light Bar Brightness: Adjusts the brightness of the Dualshock 4 light bar. Nobody deserves that super bright light reflecting on the TV screen, right? 5) Synchronize Local Memory Slots: The “Sync Slots” operation replaces all data of the Gtuner’s memory slots with the bytecodes (Scripts/GamePacks) from the Titan One device. 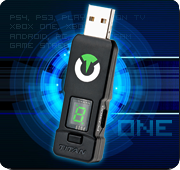 No more worries in lose all scripts, GamePacks and configurations when programing multiple Titan One devices! You asked, you got it! #1 Gtuner Pro 3.0 Release! For the first announcement today we are proud to release a brand new version of Gtuner. Probably the most noticeable difference is the Online Library and Programmer user interface update, which is now much cleaner and match the theme of ConsoleTuner website. However the updates does not end on the new UI. We also made improvements on the software algorithms, bug fixes, misspelling fixes, added support for our brand new device (Titan One) and an extended API for Gtuner plugins. Everything done without compromise the compatibility with the last generation devices. Talking about last gen devices. A new version of the firmware (1.60) is now available for update. It adds support for Gtuner Pro in your GamepadProxy devices. You can download Gtuner Pro 3.0 in the download page of this website, or perform the automatic software update on Gtuner (menu Tools -> Gtuner Update).